Performance: Rapid heat-up and recovery times, and precise humidity control, are achieved with a digitally controlled dual-element ducted heating and humidity system. Intelligent power distribution maximizes efficiency and assures food is held at the desired temperature. Relative humidity is continuously monitored and controlled to assure a consistent cabinet environment. Low water sensor and low temperature alarm assure cabinet is performing safely. 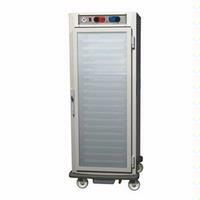 Doors: C5 cabinets are all available with a choice of insulated solid or clear double pane tempered glass doors. Clear doors provide visibility of the contents of the cabinet without the heat loss associated with opening the door. Full Height cabinets can be configured with standard full length or Dutch style doors. All doors lift off and are field reversible. table pans on adjustable 1 1/2" increments. Lip load slides hold 18"x26"
sheet pans on 1 1/2" increments. ground up. High-quality components and robust construction provide a long life of service and worry-free use. to prevent damage, and to simplify cleaning. 7 1/2 foot cord with NEMA 5-20P plug. Cord mounted on top (Full, 3/4, Pass Thru) or back (1/2, Under Counter) can be field reversed.